I'm taking a little break from my apple frenzy to bring you a few side dish ideas for Thanksgiving. Us Canadians (let's just say I'm Canadian for the sake of this conversation) will be celebrating Thanksgiving this coming Monday. I've been working on holiday side dishes since the early days of September (ah, the joys of being a food writer!) so safe to say that I've been feeling the holiday spirit for a little while now. Here's a small selection of the results - some traditional, some a little less so, so take your pick! What's your favorite holiday dish? Boil the potatoes until soft, drain and mash. Add the roughly chopped beets to a pan with 2 tablespoons of water and cook until the beets are soft (about 5-6 minutes). Remove from the heat and mash using the back of a spoon. Mix the beets and potatoes until the mixture is homogeneous. Transfer the mixture to a pot on medium low heat. Add the softened butter, heavy cream and a good pinch of salt and pepper. Once the puree is velvety and warm, remove from the heat and serve. Preheat oven to 400F. Using a fork, prick the skin of the sweet potatoes, set on a baking sheet and bake for 45 min-1 hour or until soft. Remove from the oven, and peel once the sweet potatoes are cool enough to handle. Reduce the heat to 350 F.
Place the sweet potato flesh in a bowl, and mash with the back of a spoon. Stir in the softened butter, the sugar and the milk. Add the nutmeg, cinnamon and a good pinch of salt and pepper. Place the sweet potato mixture in individual ramekins or a casserole dish. Bake for 30-40 minutes or until the top of the mixture is golden. Cook the green beans in a big pot of salted boiling water. The water should be as salty as sea water. Remove from the heat as soon as the beans are tender. Place them immediately in a big bowl of salted ice cold water with ice cubes to ensure that the cooking process stops and that the beans maintain their vibrant green color. Once the beans are completely cold, pat them dry using a kitchen towel. Place a pan on medium heat, and add the slithered almonds. Stir frequently until the almonds are golden brown. Remove from the heat and place in a small bowl to cool down. Place a pan on medium low heat and add a good drizzle of olive oil. Place the finely sliced shallots in the pan and cook, stirring often, until the shallots are soft and translucent (about 10 minutes). Remove from the heat and reserve. In a small bowl, whisk the olive oil and lemon juice and a good pinch of salt and pepper. Add the shallots and stir. Spoon the vinaigrette over the green beans, and sprinkle with the roasted almonds. You've got me excited for thanksgiving now! Oooh - they all look delicious! This is so inspiring (even though I have another month before I have to start planning Thanksgiving!). mmm love the idea of the sweet potato casserole! yumm!!! I like the idea of adding canned beets to a purée. Handling beets always terrifies me, like the whole kitchen is going to turn red. This would make it really easy. I guess that if Thanksgiving is that close then it's time to start thinking about it. I just refused to believe another year has gone by so fast :-p Great ideas! Lovely! The beet and potato puree is really interesting. Happy Thanksgiving! The beats and sweet potato look delicious and sound like they'd taste wonderful! My mother just had some dental work done and can't chew solids very well so I may try these out on her....And thanks for visiting our blog and commenting! I'm sure they are all wonderful, but the photo of the green bean salad really caught my eye. Have a great holiday. What a lovely Fall color palette! The Taste of Oregon: I hope you do! Mary: Thanks, have a great holiday full of great food! OOOOHHHH, do these look wonderful. I love the beet puree. And the beans. And the sweet potatoes. We don't have Thanksgiving here in Belgium, but we've invited some friends for dinner that weekend (the NOVEMBER one, rather than the October one). Thanks for these ideas! Those recipes are terrific- especially the beet/potato dish. Photographs are excellent too- enjoyed your blog very much. That's right. Your Thanksgiving comes before ours in the US. When we lived in the Bahamas, they of course didn't celebrate Thanksgiving but they sure enjoyed coming to our home for turkey. I love these sides, especially the green beans. Everything is gorgeous as always. Yum I think I'm ready to have that Sweet Potato Casserole for dinner! Lovely blog! That has to be the prettiest dish of green beans I've ever seen. Any Thanksgiving table would be proud to have that front and center. 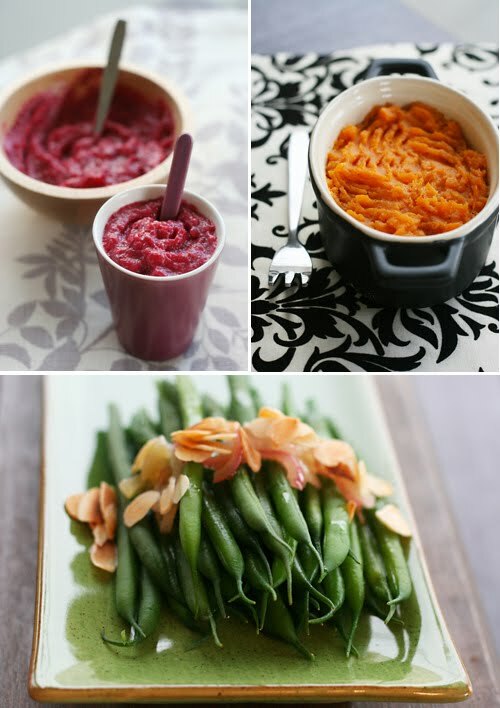 What a gorgeous side dishes! But is thanksgiving in Canada different in date from the one in the US? I thought it would be end of november or so...? I can vouch for that green bean salade with the added feta. I saw, I ate, I smilled. It was great. Hope you had as a good time visiting as we all had eating it. Sides are definitely important to the Thanksgiving dinner! Have a great Thanksgiving! A.D : I'm glad you liked the salad Adam! This is why I love that Canada Thanksgiving comes before ours - I get so many great ideas that I can plan for! Those look great. I love, love, love that little dish that the sweet potatoes are in. sweetbird: They are individual casserole dishes I found at a small kitchen store in Montreal. They come in very handy! Oh, such beautiful dishes. And there's still time to use these recipes for the American Thanksgiving day. My fiance is from Michigan, so we celebrate Thanksgiving in November, although we usually do something nice on the Canadian one too. (We used to live in Toronto! )This way we get a double holiday:) Thanks for sharing the recipes! I am an instant follower!!! great pics, great writing, great ideas. These side dishes look wonderful. Great ideas!